The piece is titled “Ephemicropolis” and was featured in the March 2012 issue of National Geographic. 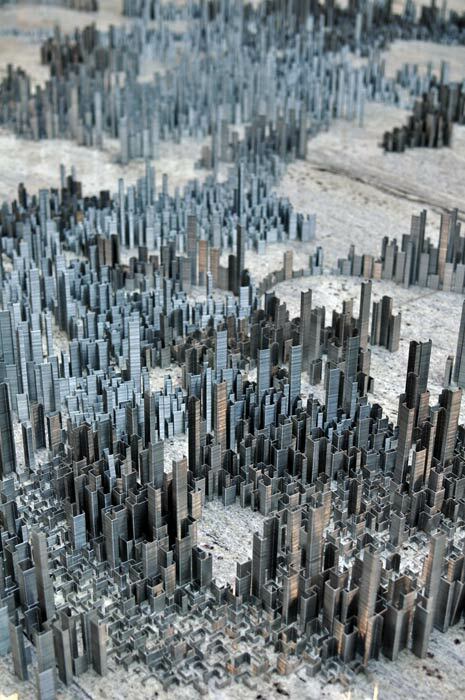 The micro-metropolis consists of over 100,000 staples meticulously put in place during a 40 hour time span. They range from 12 centimeter high stacks down to ever-so-detailed single staples. Born in Jersey but raised in Britain, Root obtained a fine art degree from University College Falmouth in 2000. However, his past experiences with architectural presentation and model building are apparent in both his 2D and 3D artwork. There is no limitation to what the imaginative and determined can create!